I walk to the train station in the cool, quiet morning, rain misting gently from the sky. More than falling, the tiny drips hang in the air like stars in the night sky, and I am strolling through the constellations, collecting their magic dust on my skin. Walking through the rain-like-stars, I feel lyrical, poetic. But is this right? I wonder, my mind spinning with the combination of angst and hope that plagues me in the early morning. Does anyone want my lyricism, my roaming prose? Or was I better off writing dry grant proposals and pithy newsletter articles? How can life feel so lovely and so hard all at once? What am I doing, anyway? I try very hard to pay attention to what surrounds me, to think more about the raindrops and stars and less about myself. I usually walk with a podcast in my ears, but not today, and the lake laps like a whisper, the cars pass and the construction workers labor with a quieter rumble than I’d expected. I wonder what I thought I was canceling out all this time. As I walk past the trees that bloom with glorious red flowers boasting tinsel-like fronds, I notice that the flowers are beginning to fade; their blood-red strands rest in the cracks of the sidewalk like so many threads of saffron. Tiny succulents are growing amongst the trees and rocks that line my path; they are adorable, like most small things, and suddenly I feel a little better. One morning last weekend, a slightly-too-brown cake threw me into a tailspin that ended with me facedown on the bed, crying not so much about the cake but about everything else that feels wrong in my life and the world. Artichokes “en cocotte” brought me to similarly desperate tears not so long before. It’s rather clear that I ought to be spending more time in silence, focusing on small miracles, reveling in every last thing that is beautiful and probably also returning to the practice of yoga. It’s easier, most days, to fill the quiet with NPR and music and food podcasts so that I don’t have to be alone with my crazy, overactive brain, but that crazy is mine, after all, and the two of us must make peace. In the interest of peace, and just in case I’m not alone, I offer a dish that is straightforward and uncomplicated, the sort of recipe that is unlikely to bring you to tears and may even quiet existential musings. 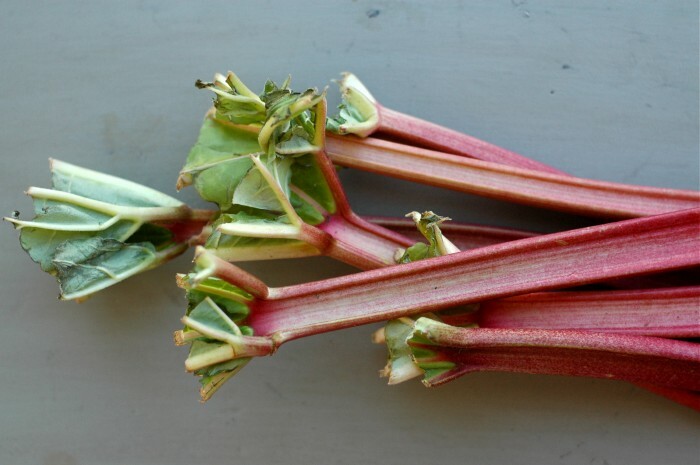 I first roasted rhubarb a few years ago as an easy, unfussy dessert to share with my mom when she visited me during springtime in Grand Rapids, and after that one go, I was hooked. 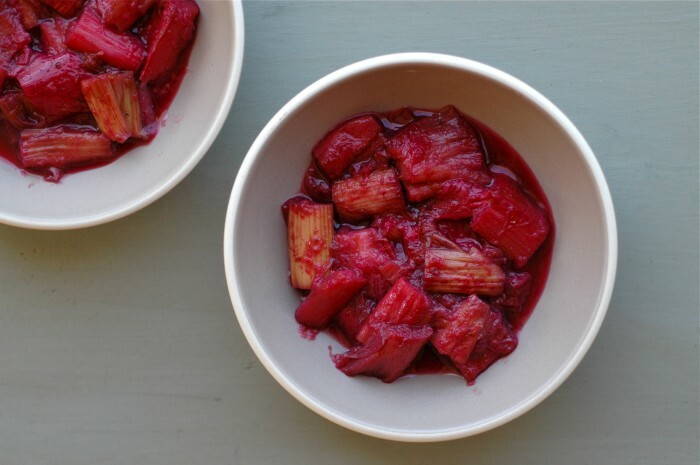 The preparation is simple, and after mingling with just a few ingredients for a half hour in the oven, rhubarb emerges with an incredible depth of flavor and color. It’s marvelous. I’m rather obsessed. Which led me, of course, to an experiment last weekend in which I made several (eight?) versions of this dish in small ramekins, comparing white sugar and brown sugar and honey and various combinations and amounts of wine and orange. The recipe below is the winner, at least in my kitchen. This will help us, I think. 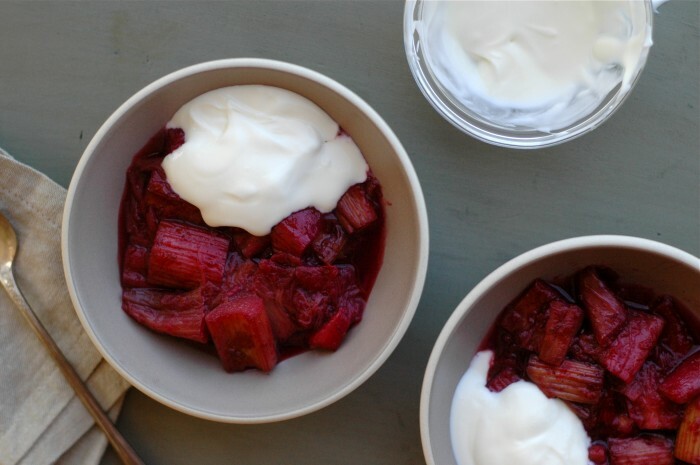 Roasted rhubarb is delicious warm, room temperature or cold and adorned with vanilla ice cream, crème fraîche, mascarpone, Greek yogurt or nothing at all. I find it pretty magical with a dollop of crème fraîche, as I’ve directed here, but feel free to substitute your favorite creamy topping. 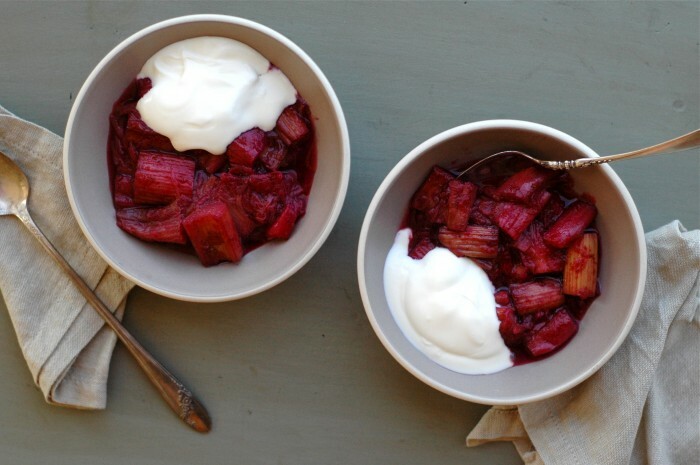 The rhubarb will also pair wonderfully with many breakfast items: oatmeal, muesli, granola, yogurt and fruits, pancakes, waffles, etc. 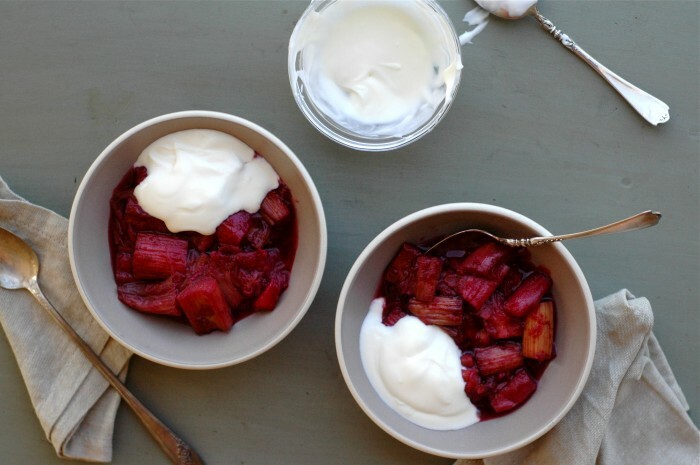 In these cases, spoon it atop or alongside. In the interest of frugality, I don’t often purchase vanilla beans, and you can certainly substitute extract here. However, if there is any time to splurge and spring for a vanilla bean, this would be it. 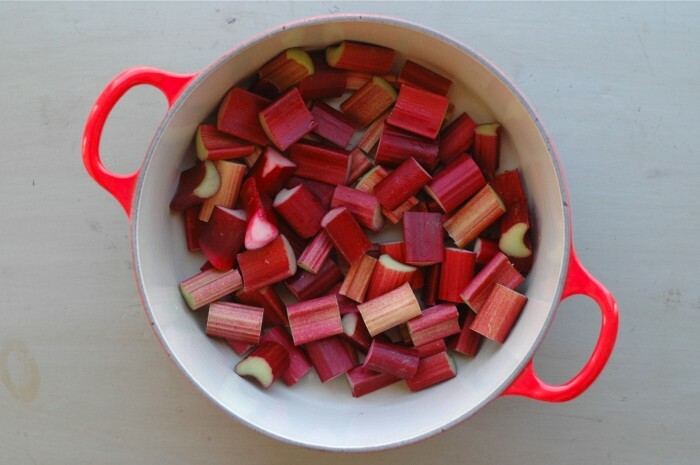 Trim the rhubarb and cut it into 1 to 1 1/4-inch pieces. 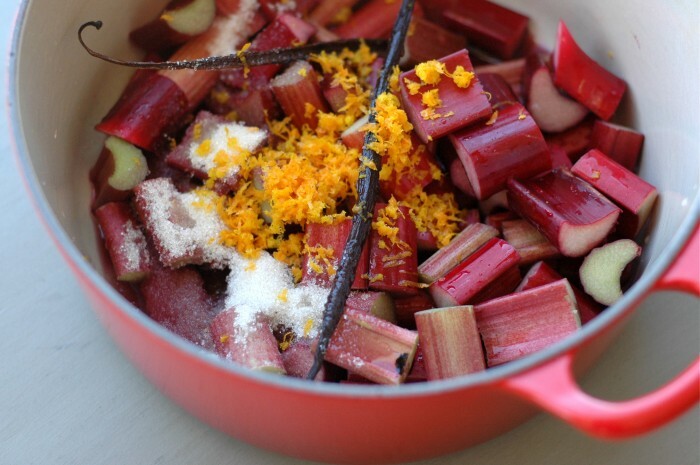 Place the rhubarb in a Dutch oven or other deep, oven-safe pot. Split the vanilla bean, remove the seeds and put both the pod and seeds into the pot. Add the wine, sugar, orange zest and orange juice. Stir to combine. 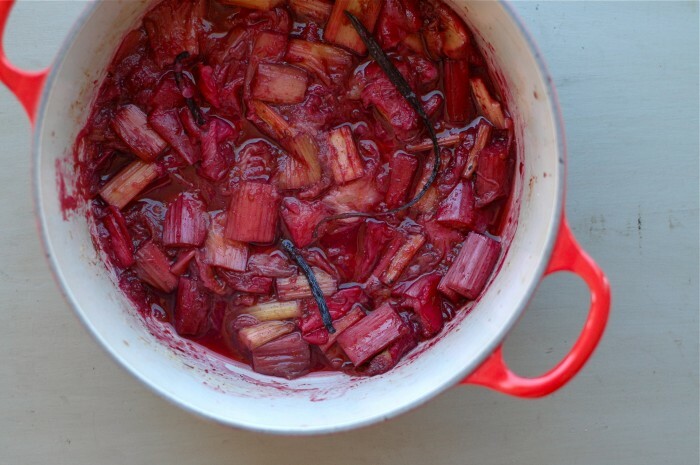 Bake, uncovered, for 25 to 30 minutes, until the rhubarb is soft and beginning to collapse. Stir once midway through cooking. Remove the vanilla pods. 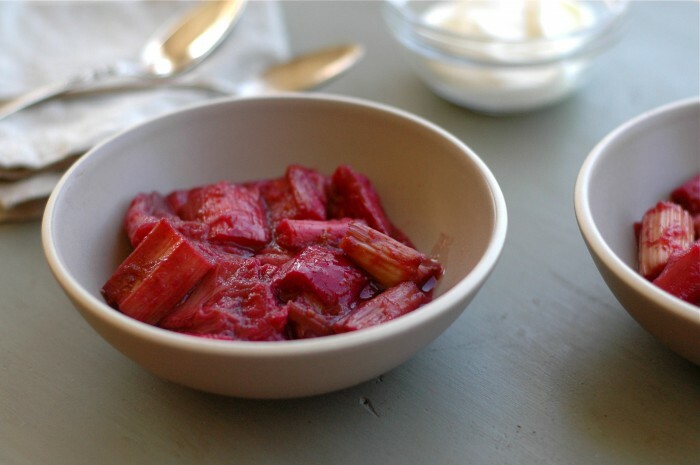 Serve the rhubarb warm, at room temperature or cold in small bowls and dolloped with crème fraîche. This is so beautiful! I’m sorry to hear things have been tough. I, too, find myself turning to music and NPR, and whatever technological distractions are within reach to distract myself from bigger life questions sometimes. But as hard as it is sometimes, it’s good to just cut the noise and listen to the real life happening around you. Beautiful post and beautiful photos. 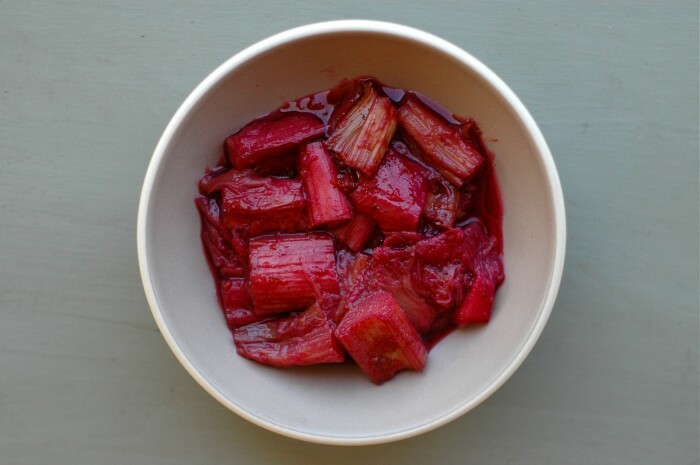 I made this reipe for a friend who had never had rhubarb. I served it over ice cream, which was less healthy but delicious. Thank you for the great recipe, pictures and beautiful descriptive words. I hope that your weekend was full of sunshine and delicious food. Thanks!